I have been writing romance stories since I was 12 years old, but I have been a paid romance writer for the past 7 years. I have been a paid romance writer selling romance articles to hundreds of websites for the past 7 years. “How To Marry Mr. Rich” is my first book. The inspiration came from being a Welfare Mom. But the book contains 12 chapters of no nonsense tested real world advice on how any women can get rich by marrying Mr. Rich. 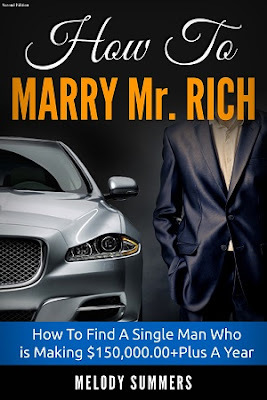 “How To Marry Mr. Rich” will be my first and only non-fiction book. “How To Marry Mr. Rich” it's “A Women's Indispensable 21 Century Handbook"
Well, 95% of rich women will marry rich men and no one calls these women “Gold Diggers” but if a poor or middle-class woman marries a rich man, she instantly becomes a Gold Digger? This is crazy...My book “How To Marry Mr. Rich” will free women's minds up to live a 100% better and richer life! BLOG WRITER'S NOTE TO AUTHOR: Your book sounds quite interesting and I want to thank you for sending me a free copy of it. I look forward to reading it. Thanks for the interview and good luck in the future with your other romance novels.